At the moment, business is slow enough to make wholesale sewing a possibility! This differs from years past, so if you've wanted SBP slings for your store, I can now do them. However, prices on my website are not keystoned, and in order to keep my sales going, I do not plan to raise my prices. My wholesale prices are between $12-25 lower than the retail prices shown on my site. I know this is a lower markdown than the majority of wholesalers offer and I do apologize for the difference. However, because my prices are already quite low, I'm hoping this isn't an impediment. 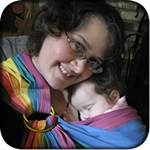 I am also able to sew wrap conversion slings for retailers, if they provide the wraps; this generally works better than purchasing in-stock slings to resell, since the wraps can be an exclusive to a particular retailer and competition with my site is then not an issue. After the ASTM standards for slings become mandatory, I hope to work with retailers in providing custom and exclusive WCRS services. Please email if you'd like to set up a wholesale account -- I am happy to accommodate you!